Arguably the greatest extreme skier to ever live, Doug Coombs pioneered hundreds of first descents down the biggest, steepest, most dangerous mountains in the world?from the Grand Teton "Otter Body" in Jackson Hole; to Mount Vinson, the highest point in Antarctica; to far-flung drops such as Wyatt Peak in Kyrgyzstan. He graced magazine covers, wowed moviegoers, became the face of top ski companies, and ascended as the king of big-mountain extreme skiing. His place at the top was confirmed in 1991 when he won the very first World Extreme Ski Competition in Valdez, Alaska. 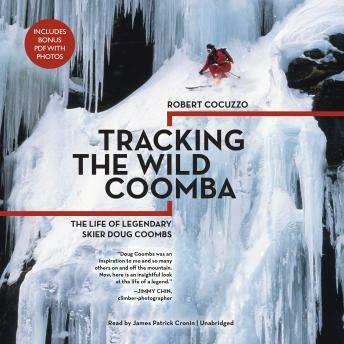 Now his story is told for the first time in Robert Cocuzzo's Tracking the Wild Coomba. From the slopes of his childhood in New England; to the steep chutes of his early career in Montana and Wyoming; to the deep, avalanche-prone powder of his guiding years in Alaska; and, ultimately, to the terrifying terrain of the French Alps, Coombs's greatness was in how he skied. What most people didn't know was that Coombs skied so perfectly in part because he had no other choice?at the age of sixteen he crashed off a jump in New Hampshire and broke his neck. Doctors said it was a miracle he wasn't paralyzed, and that another bad fall could kill him. Many believe it was this second chance that inspired the extraordinary life he led until his tragic death in 2006, the result of an attempted rescue of a fellow skier.